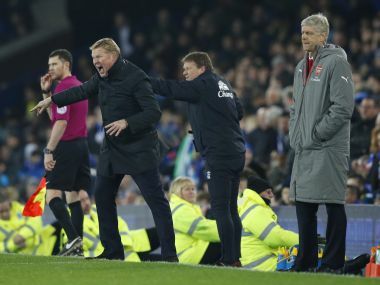 Ronald Koeman reacted sarcastically to opposite number Arsene Wenger after Everton ended Arsenal's nine-month unbeaten away run in the Premier League in an eventful 2-1 victory at Goodison Park. 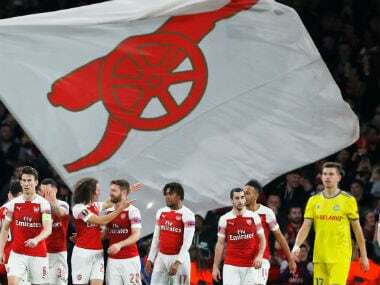 Arsenal manager Wenger, defeated for just the second time this season, blamed referee Mark Clattenburg for awarding the first of a series of corners from which Ashley Williams headed in the 86th-minute winner. But Koeman responded bullishly and claimed he had targeted Arsenal's weak points by instructing his players to adopt an aggressive approach against the Premier League title hopefuls. "I'm not surprised about Wenger's comments because it is the third time in a row that I won as a manager at home against Arsenal," said the Everton manager after Tuesday's game. "And that is three times in a row that it was about the referee. OK, sorry Arsenal. We won through the referee tonight, sorry! "Their weakness is if you go face-to-face and win battles and you run and you go. Then you need a bit of luck and we deserved that. "If you fight for every ball and are aggressive, you see the reaction of the crowd and with a lot of aggression, you can make life difficult. Then it is really difficult to beat Everton here. "We showed that after 20 minutes. We went face-to-face against them and that's what you have to do against teams like Arsenal." Williams struck from Ross Barkley's corner after Alexis Sanchez's 20th-minute opener for Arsenal, a deflected free-kick, had been cancelled out by Seamus Coleman's 44th-minute header. 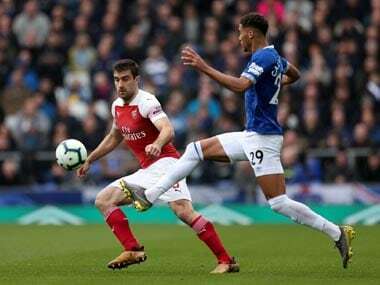 Citing Clattenburg's decision to award a corner despite the ball appearing to have gone out off Everton substitute Dominic Calvert-Lewin, Wenger said his side had been hard done by. "Of course it was not a corner," said Wenger. "It was the wrong decision. "You could see from outside that it was no corner. I'm very disappointed because Clattenburg was in a very good position to see the player had the ball out. "It is not the first time we are unlucky with his decision this season. But overall I don't want to speak about the referee too much." 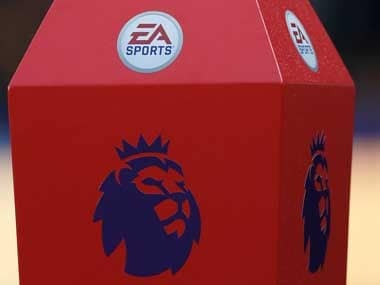 The high stakes, with Everton looking to end a five-game winless run and Arsenal seeking a win that would have taken them to the top of the table, spilled over at half-time as the teams left the field. Rival players exchanged words and traded pushes, with James McCarthy seeming to accost Arsenal playmaker Mesut Ozil. "I was close to it and didn't see a lot there," said Wenger. "A little bit of pushing, but nothing dramatic." Wenger also insisted his players had not frozen on a big occasion and with a fervent Goodison crowd growing ever more vocal as the game progressed. "No," he said. "We were a little bit less fresh and maybe we lost a little bit of urgency when we were 1-0 up and perfectly in control of the game. "We are used to playing away at places like this and when you play nine months away from home unbeaten, then you have that normally every week. "They made the game physical, they defended well, they played a cup game and made a big difference from what I had seen from them, the past few weeks. "They fought for every ball. I don't think they can repeat that every single game." 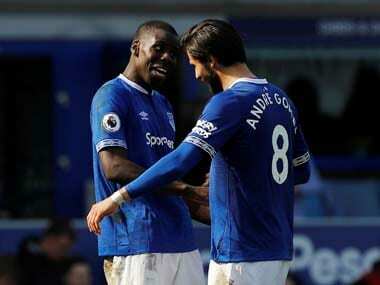 Everton will have to do that in their next game, the home Merseyside derby with Liverpool on Monday, and Koeman said the victory was perfect preparation. "Of course now it is a totally different situation to go into Monday," he said. "We have three points in the pocket, a good performance and we know we are very strong at home. "We are still unbeaten at home. We know everything about the Merseyside derby and if we play with the passion we showed tonight (Tuesday), we can have a good result."